Tonight, NASCAR set the grid for Sunday’s NASCAR Cup Series race. Moments ago, MENCS qualifying concluded. View Las Vegas Motor Speedway qualifying results below. Ahead of qualifying, NASCAR had a few issues with their new Optical Scanning Station. It wasn’t working. They got the issues resolved and all cars have made it through inspection. Kyle Busch was the last car through, just ahead of the green. The wind is throwing these drivers for a loop. 20-35 gusts of wind are creating in consistencies from lap to lap. Leave it to the wind to make LVMS exciting. “You gotta be conscious of which direction it’s going and not over blow that corner,” Clint Bowyer tells Fox Sports ahead of qualifying. Brad Keselowski turns the first lap in knockout qualifying. His time was 30.575. 5 minutes remain, Cole Custer has just been bumped out of the top 24. He’s making his first MENCS qualifying attempt. 3 minutes remain, Jimmie Johnson is the only car that hasn’t turned a lap. He’s hitting the track now. Less than a minute, Bubba Wallace hits the track for a second time in a last ditch effort to make the top 24. He doesn’t make it to the line in time to start his lap. Menard wins round 1! The inner liner on Martin Truex Jr has broken. The tire isn’t flat but the team is pleading NASCAR to allow them to exchange the inner liner. The tire itself is fine, it’s just the inner part of the tire that’s failed. They could change it without any advantage or disadvantage to the #78. 10 minutes in round 2. The top 12 will transfer. Green, Blaney to the top of the board early. 7 minutes remain, Harvick to the top. NASCAR didn’t allow Truex to repair the inner liner. However, he just went out on track, P4. 2 minutes remain, Keselowski is bumped. He was 2nd fastest in round 1. He hits the track, 8th! He puts Kyle Busch on the bubble. Menard to 11th, Kyle Busch is out and now Kurt Busch is on the bubble. Kevin Harvick wins round 2. 5 minutes in round 3. 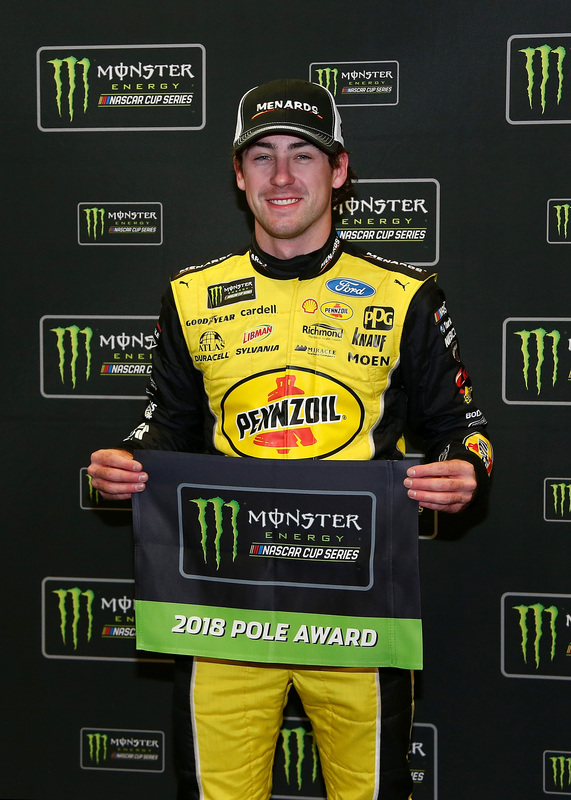 It’s the run for the pole. The first car on track is Kevin Harvick. He turned a lap of 28.384. 1 minutes and 30 seconds remain, Blaney to the top! Harvick watches from outside the car as he falls to 2nd. Bowyer is hard on the splitter on the entry to the corner.